On I trundle with the Karoo. What a challenge and an adventure. I’m now halfway through Part 7 and then there is an edge. These colours felt strange in the middle of a heatwave a few months ago, but I’m so enjoying working with them now. Yesterday afternoon, I was sitting in the Park whilst my grandchildren played with their friends after school, the autumn leaves were falling around me, my blanket on my lap whilst I worked on it, and the warm October sun on my face. That to me is a slice of heaven right there! The design is by Jen Tyler of Hooks n Tales. Stylecraft Special DK and a 4.5mm hook. You can find the list of colours on my Ravelry Page. This pattern is not for the faint-hearted! and there are literally 100s of ends to sew in, but I do really like the result. I’d like to make this pattern again in different colours, but I’m not sure when I will be ready to dedicate so much time and attention to such a big project again. Whist sewing in all those ends at home in the evenings, I listen to the radio – this fabulous music programme keeps me company – available on iPlayer for the next 29 days. Tah Dah!!! Drum roll please! This has been a really fun project to make. 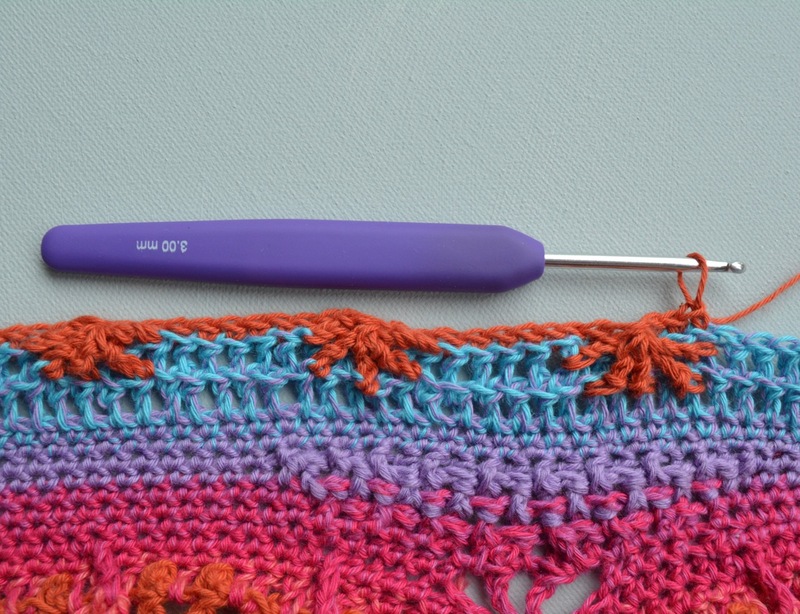 The journey began back in April when Helen Shrimpton’s Crochet Along started and I finished the CAL back in June, but I wanted to do a few more rows to make it bigger and work out how to make a scalloped edge. The bedspread, shown here on a 5′ wide double bed, had to wait patiently in the background whilst I made a couple of dreamcatchers for birthday presents, and then it was hard to pick it up again. 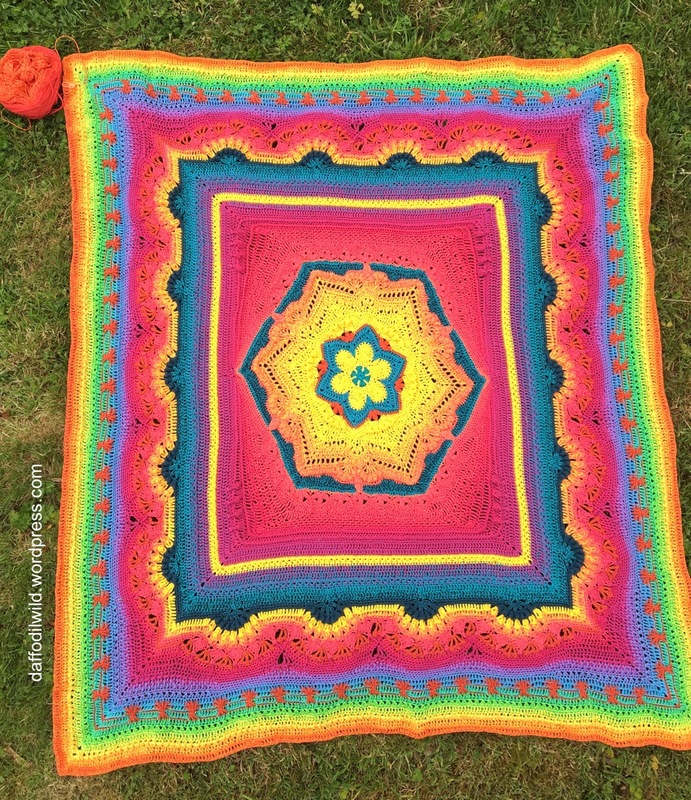 I can highly recommend Helen’s patterns and this one is FREE and comes with a video tutorial. To see other amazing Cosmics, join Helen’s Hookaholics on FB and go to the Photo Albums. If you ever need inspiration for colour combinations there is surely no better place to go. I really enjoyed mixing up the Whirls and playing with the gradients in the colours to get the effect I wanted. I am so happy with my zingy bedspread! 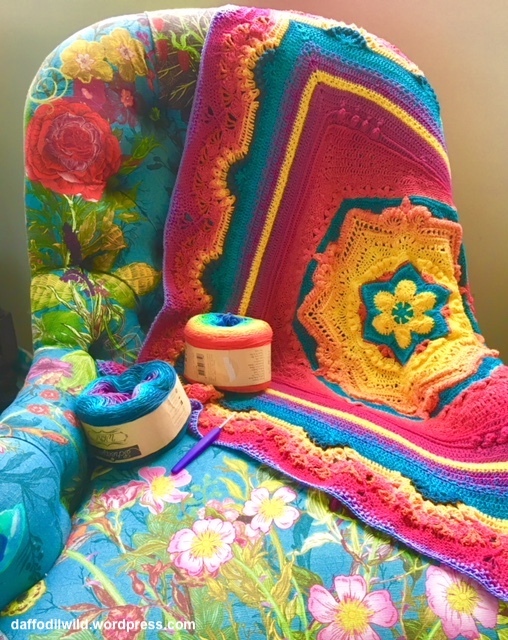 doesn’t it look perfect with this chair covered in a luxurious fabric by ‘Timorous Beasties‘…..
…….. on to Part 7 in which we meet the dastardly Cosmic Stars!!! Helen’s You Tube tutorial for Part 7 is here. Continuing with the Jumping Jelly Whirl until completing Round 78, I worked Round 79, the first part of the Cosmic Stars, in Citrus Whirlette. 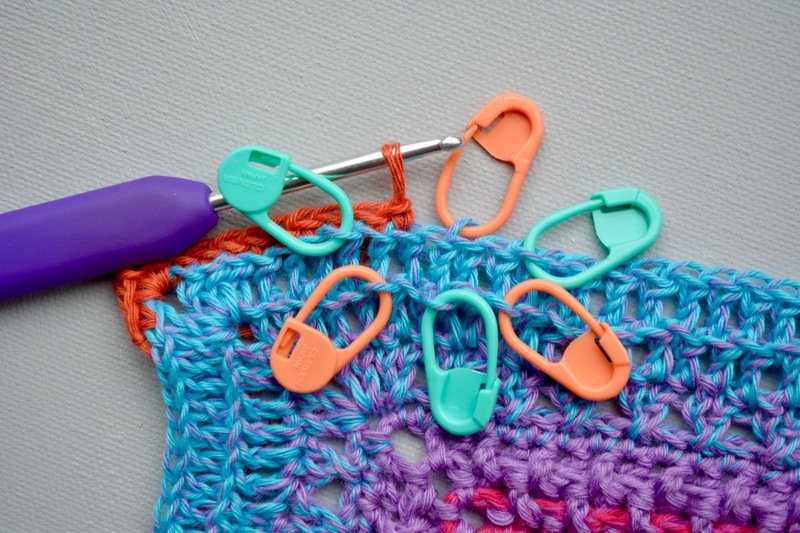 I don’t know if it is because I am left-handed and following a right-handed video, or because I was using a 4 ply cotton yarn which has no give, but I just could not get the placement of the spokes right – stitch markers to the rescue! There was much chat on the FB groups about these stars and I was near to giving up on them when one wonderful person suggested working into front posts instead of front loops and this worked much better for me. Phew! 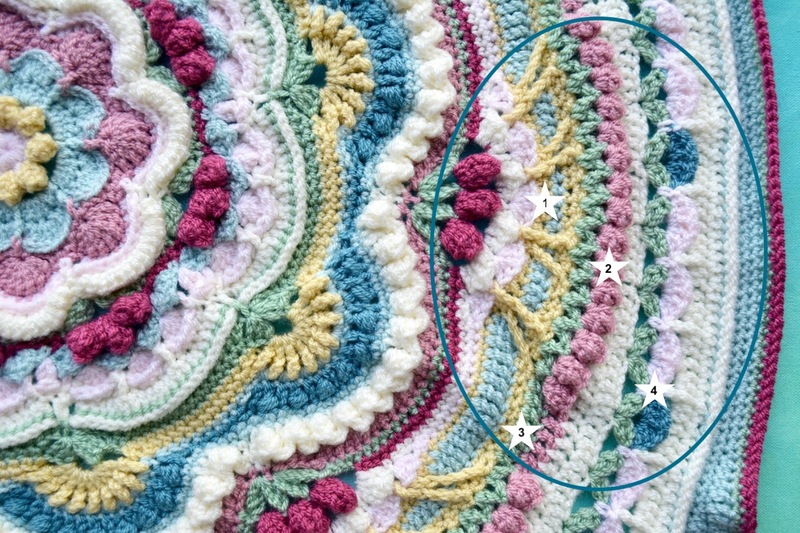 I was so relieved to get to the end of those Stars, knowing I would never have to make them again! However, lots of people said they loved them and are making several more Cosmics including the Stars. Mercifully Part 8 was delightfully relaxing as I continued into the orange section of the Jumping Jelly. A bedspread in the making for one of my twin Granddaughters. 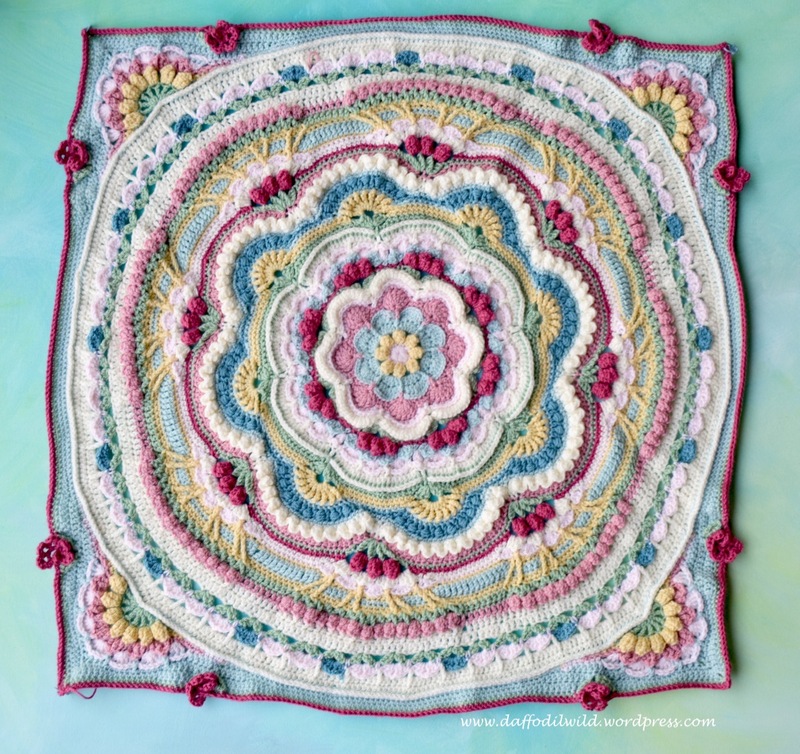 I am mostly following Helen Shrimpton’s wonderful Rosslyn Pattern. This is a paid for pattern and worth every penny! 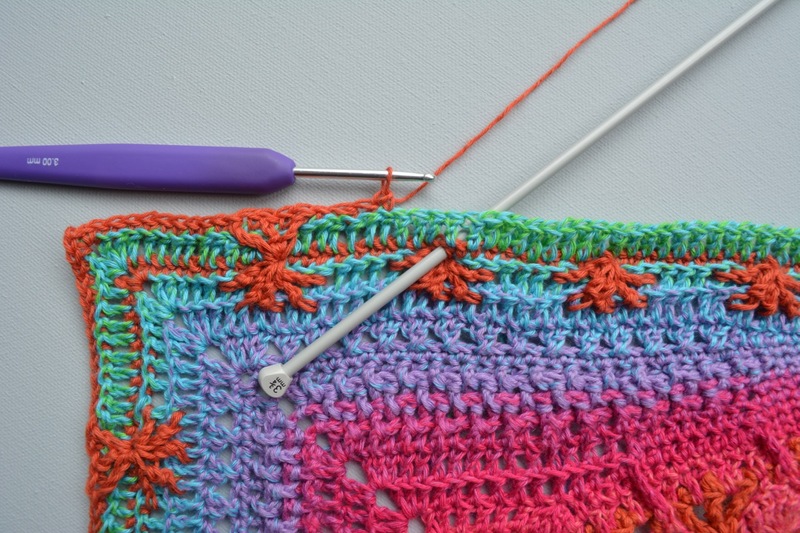 It is a wonderful pattern to follow and very relaxing to make. Well it would be if only I could stop myself making a few additions, changes and adjustments as I go – the creative mind is never at rest! I was wondering if I was making the pattern look too ‘busy’, but I think I will stick with my changes. What do you think? The yarn is Stylecraft Special DK, the hook 4.5mm. Soft Peach, Buttermilk, Duck Egg, Pale Rose, Cream, Raspberry, Lincoln, Storm. At this stage it measures 28 x 28 inches or 72 x 72 cm. 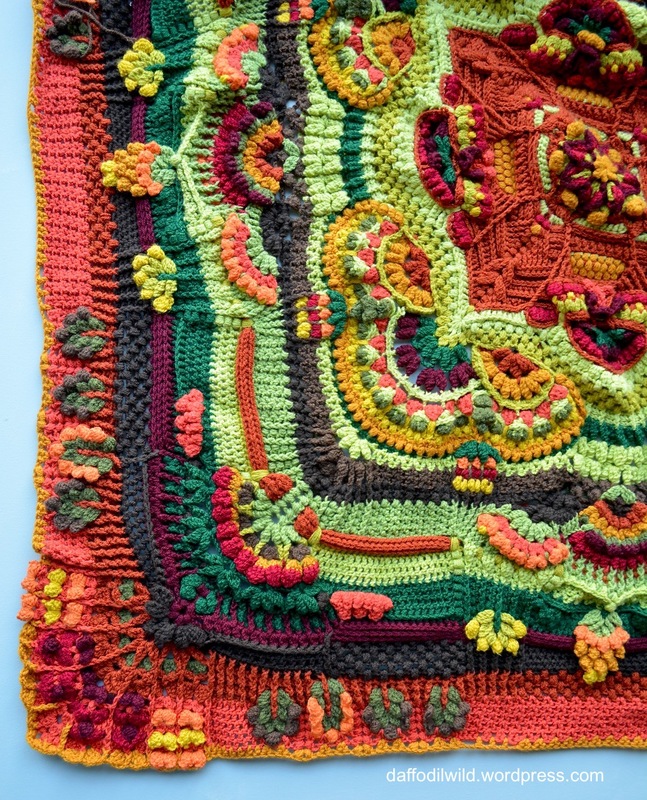 Have you made any of Helen Shrimpton’s patterns? If so please leave a link, I’d love to see them. And if you enjoy a good old natter, pop along over to Cathy’s place for Knit and Natter Friday. At last my blanket for Master R is finished! My daughter thinks it looks a bit wizardy – I see what she means, the designs could definitely be magical symbols used in an 8 year old’s incantations – he’s reading the Harry Potter books at the moment. The blanket measures 1metre x 1m30cm, just right to snuggle under on the sofa, or to go over his duvet on his top-bunk bed. Master R is now aged 8. He was 5 when I started it. He wanted a blanket in purples and greens, not colours I would choose to put together. I usually LOVE co-creating things for my grandchildren and bringing their ideas to life, but this has been my most challenging project to date. Back in July I wrote of the journey thus far showing some of the early ideas, experiments and samples that had been rejected by my co-designer. Together we arrived at these Squares and colours, he knows what he likes! On the whole I feel it is important to encourage children to make as many decisions for themselves as they can – but I have to admit this one took me to pushing past my own resistances to make something I personally did not love! It languished in the W.I.P. pile for far too long at times. However I’m thrilled with how it turned out and to know Master R will get what he wanted is very satisfying indeed. 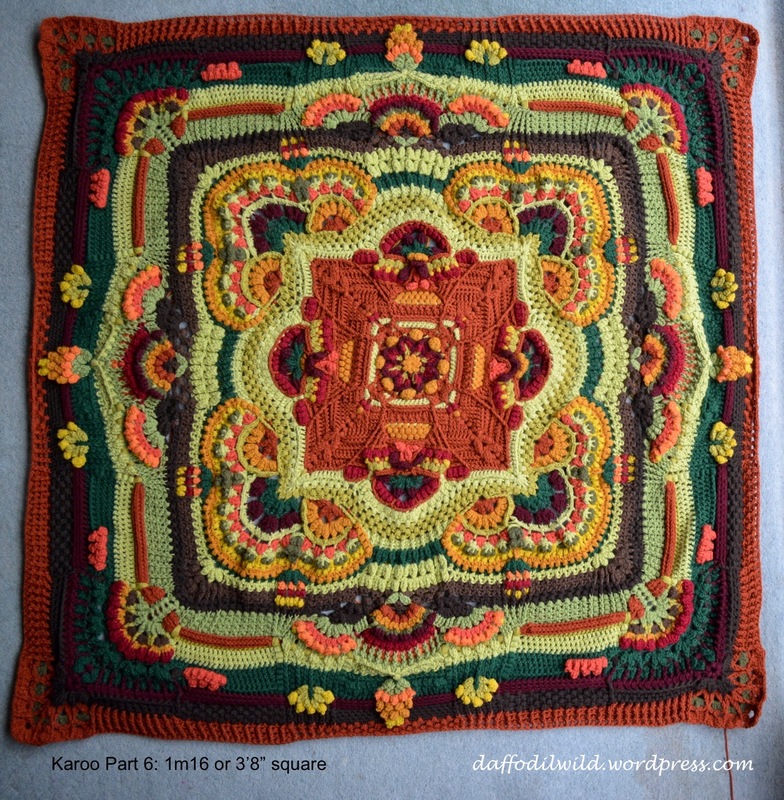 The square patterns are from the Nuts About Squares crochet along. Starting with the surface zig-zag as shown in Esme’s Winter Cottage, then a row of double crochet (US) in Emperor; a row of Single Crochet (US) in Khaki; a row of double crochet in the back loops only, in Meadow; a row of SCs in Khaki; then a row of back loop DCs in Emperor; finished with a row of Crab Stitch in Emperor. I’m enjoying my Ta Dah! moment! Going back to the dark side! The squares are arranged in rows of like squares at the moment – this will not be the final placement. before I was ready to return to Master R’s colour choices. 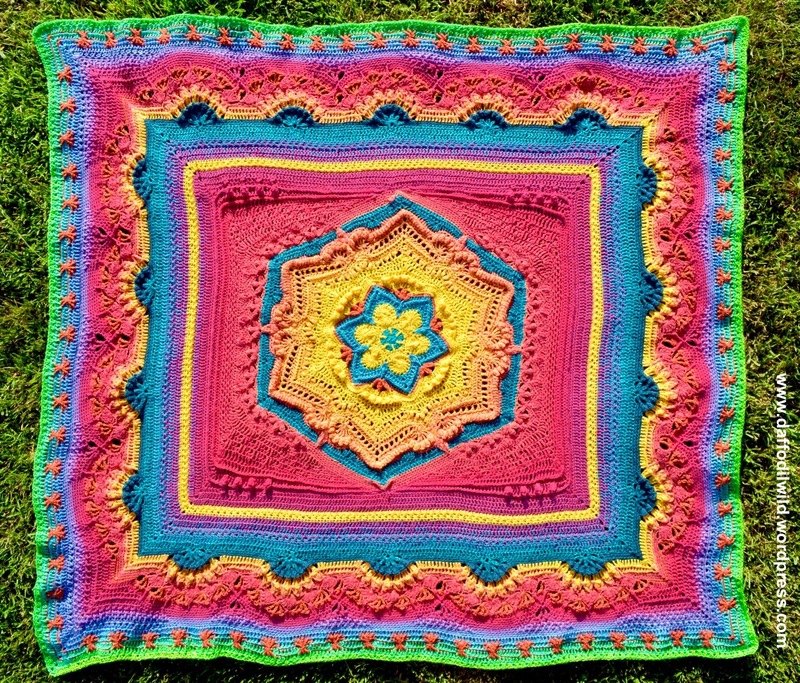 I’ve decided to leave it at these 12 squares and do a wide border – I just know it will languish for far too long in the UFO pile if I try to make myself crochet more squares! Are you struggling with any WIPs at the moment? Leave a link in the comments and we can share your pain!